I have no doubt that as the conductor listened during that first orchestra performance, he heard not just what they played that day, but the music they will play one day. He knows that with each passing year their sound will be richer and more in tune, the rhythms they play more complex, their form and technique more precise. 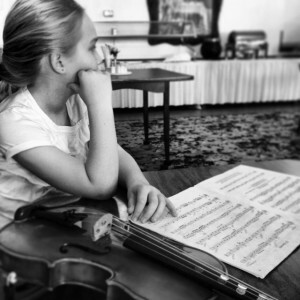 I remember my daughter’s first private violin lesson: after taking her violin out of the case, she looked with uncertainty at both the instrument and the notes on the page. Her teacher Carolyn sensed her nervousness and paused. She took both my daughter’s hands in her own, looked her in the eye, and promised her that “in this room you are free to make a million mistakes.” Her teacher had just told her the exact words she needed to hear. My daughter has made no shortage of mistakes in the two years since, but those mistakes became lessons because they happened in the safety of that promise. My daughter and Carolyn have worked tirelessly on form and posture, on rhythm and theory, on melody and pitch. Throughout it all, Carolyn has celebrated the small victories and improvements, gently creating the habits that will lead to future success. Carolyn always picks just one or two things to work on, never overwhelming her, but always pushing her to learn just one more thing. On those days when the lesson isn’t going well, she takes out her violin and plays along with my daughter. On those weeks when it’s clear my daughter didn’t practice well, Carolyn never chastises. Instead, she finds something to encourage and has her repeat her assignments the following week. One of my favorite moments is at the beginning of every lesson as Carolyn guides my daughter through the tuning of her instrument. My daughter plays two strings and listens, and Carolyn adjusts the fine tuners, smiling and nodding her head as the strings come into tune. Every week they have done this, and without a word of instruction, my daughter has been learning to listen; one day soon, I know that Carolyn will pull herself back. Soon, my daughter will be tuning her violin by herself. I am thankful my daughter has these master teachers who understand that it is only in that moment of trying, in that moment of risk, in throwing ourselves into the unknown, that we learn and grow and become. In my classroom full of students I don’t have the luxury of one-on-one instruction and the attention it allows, but these teachers, through their example, have reminded me to ask myself what small steps and encouragement I can offer for these students in front of me, who come with dreams and open hearts, who come to learn.